Travel photography is exciting in large part because it encompasses all types of subjects. In a single day while traveling, we may have the opportunity to shoot landscapes of the scenery around us, portraits of the people we meet, wildlife images of the fauna in the region, night images after the sun goes down, and photos of the local architecture. I’ve already covered how to shoot most of these subjects in previous posts. Today we’ll focus on how to make compelling images of architecture, which includes both the exteriors and interiors of the buildings we encounter. For architectural photography, it is essential to carry a good wide-angle lens. While I’m a big fan of prime (fixed focal-length) lenses, architecture is one subject where a zoom lens comes in very handy. That’s because it can be difficult to change our vantage point when shooting large buildings in crowded urban environments. And when photographing buildings, the widest end of the zoom range should be quite wide, indeed. I recommend a lens that can zoom out to 16mm (for full-frame cameras) or even wider. The lens doesn’t have to be particularly fast, because buildings do not tend to move quickly and we can use a tripod to steady the camera for longer exposure times, but it must be of very high optical quality for architecture photography. Cheaper wide-angle lenses are prone to several kinds of distortion that can lend an unprofessional appearance to photos of buildings. I recommend ponying up for a good professional quality wide-angle zoom lens with a range of somewhere around 16-35mm, or even a fast 14-24mm lens if you have the budget for it. I use the Nikon 16-35mm f/4 lens for architecture shoots. It’s got great image quality and is very solid and well built, but at f/4 it is not super fast, and it is rather heavy and bulky. When shooting the exterior of a building with a wide-angle lens, we need to make an effort not to distort the lines of the building or its surroundings. A wide-angle lens, especially when pointed upward, has the tendency to exaggerate features so that parallel lines appear to be divergent. If you have the option of moving to a higher vantage point so you can shoot parallel to the ground instead of upward at the subject, this distortion can be greatly reduced. But for those frequent situations when you have no choice but to look up at a building from the street level, try to zoom out so that the entire subject can be included in the frame without pointing the lens too far upward. 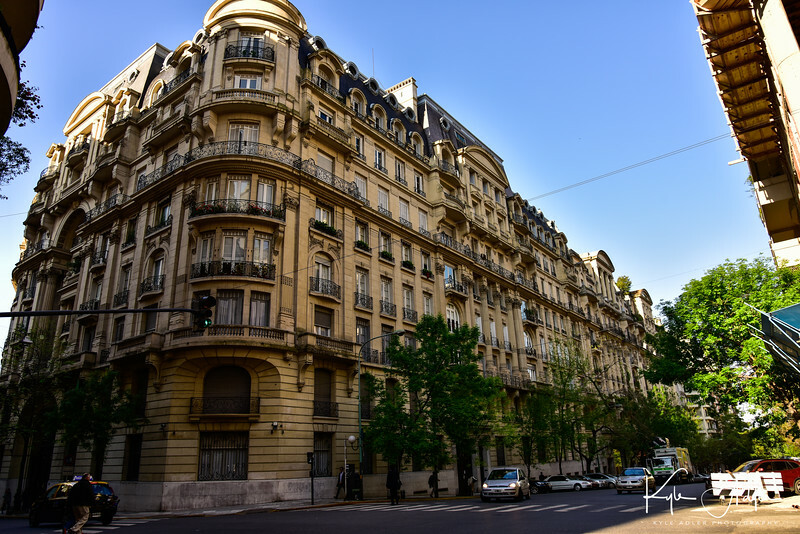 This image of a stately old building in Buenos Aires was made with the camera pointed nearly parallel to the ground so that even though a very wide focal length was required to fit the building in the frame, there is relatively little distortion of the perspective. 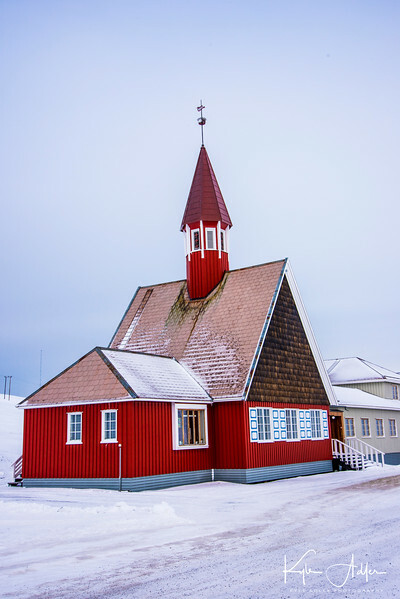 In contrast, the next image was shot from a vantage point at the same elevation as the subject, the world’s northernmost church. I climbed a snowy hill in front of Svalbard’s chapel to attain the same height as the center of the building, so that I could hold the camera exactly level to the ground and still include equal amounts of the church above and below the center of the image. This minimized the distortion and resulted in a more natural rendering of this fascinating building. I like to seek interesting colors and recurring patterns in architecture. 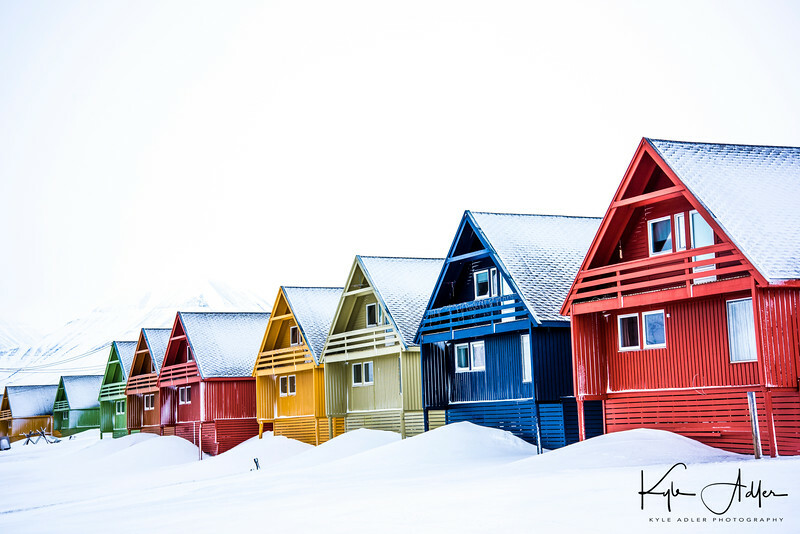 The miners’ houses in Svalbard made an intriguing subject because they were lined up in an even line of identical structures, but they varied in color. To make the image more compelling, I moved across the street and shot with a moderate telephoto lens (65mm) to compress the scene and make the houses appear closer together. I based the exposure on the light reflected from the paint on the houses, so that the snow in front of and behind the buildings was nearly blown out. In post-processing I increased the vibrance slightly to bring out the bold colors in this scene. Sometimes the most effective images of architecture hone in on the details rather than including the whole of the building. I’m always on the lookout for a characteristic or unusual feature of the buildings around me. In New Orleans’s French Quarter, I framed this shot of a lovely wrought iron balcony using a long telephoto lens so that only this one feature of the building was included. Shooting interiors of buildings poses some of the same challenges as shooting their exteriors. In particular, since a wide-angle lens is most often required and is frequently pointed upward, it is important to look at the edges of the viewfinder to try to minimize distortion of the building’s lines. 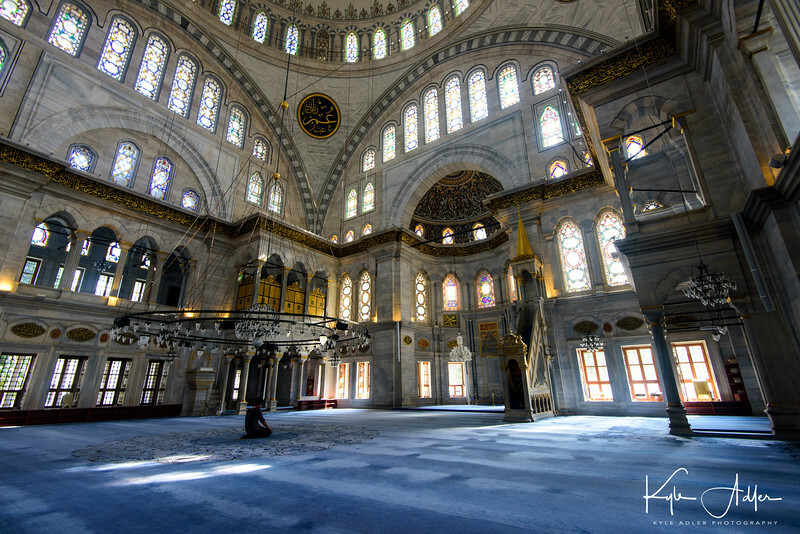 To make this wide-angle image of the inside of a grand mosque in Istanbul, I kept the camera level using a tripod and the camera’s virtual horizon function. There was still a good deal of distortion around the edges of the upper part of the scene, but I was able to control this to some degree by adjusting the images perspective using Lightroom software during post-processing. Do you have tips for shooting the interiors and exteriors of buildings? Please share them here. Want to read more posts about how to capture amazing images while traveling? Find them all here: Posts on What to Shoot.